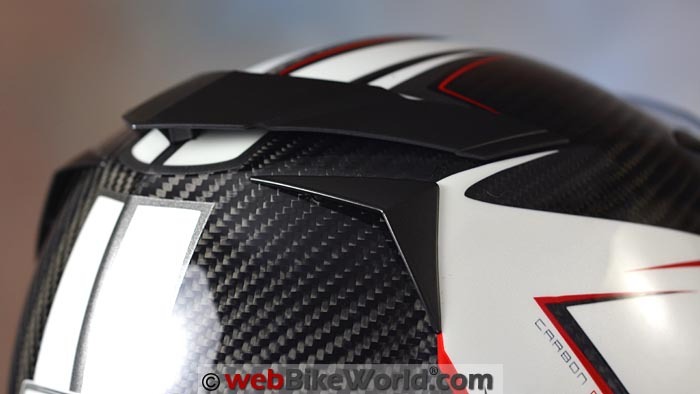 The new CMS GTRS Carbon DNA helmet is super-light and super good-looking. 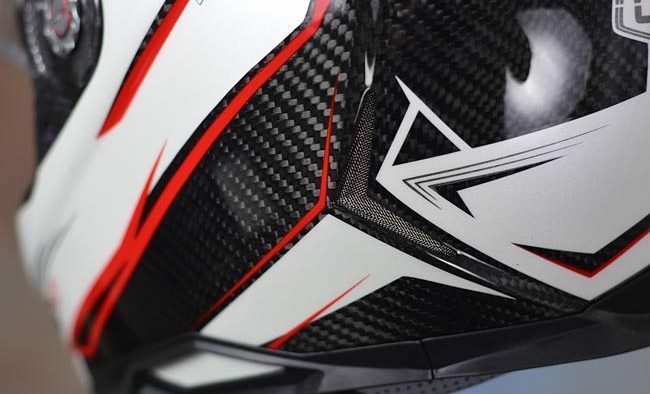 It’s a quantum leap for CMS Helmets, the Portuguese motorcycle helmet manufacturer. The overall quality, paint and construction of the multi-axial carbon fiber shell is outstanding, as are the liner and finishing details. 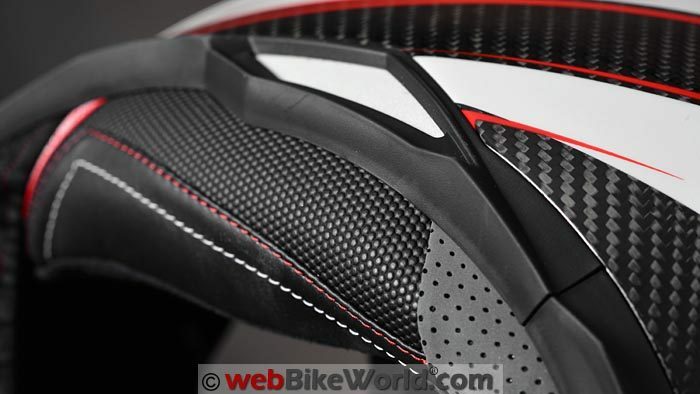 And the GTRS Carbon DNA one of the lightest motorcycle helmets of any type we have ever reviewed on webBikeWorld.com. In fact, it’s the lightest size XL full-face helmet we have reviewed, period. But the lightweight construction doesn’t mean you’ll have to compromise, because the GTRS Carbon DNA is also surprisingly quiet and the interior feels plush and comfortable. 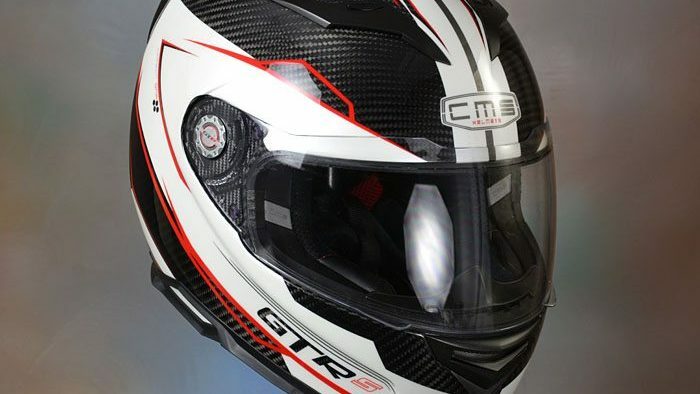 CMS Helmets is a relatively unknown brand, but that will certainly change with the introduction of the GTRS line of carbon and composite “Supersport” helmets. We have been reviewing CMS helmets since way back in 2006, with the CMS GP-4 (review), a competitively-priced full-face helmet with basic features and cool graphics. That was followed by previews of the CMS D-Jet open face helmet (review) and the CMS XR-7 off-road helmet (review) in 2008. In 2010, the CMS SUV Apribile flip-up was reviewed and after that, we sort of lost track of CMS until now. CMS Helmets didn’t go away; in fact, the young motorcycle helmet manufacturer continued to improve quality and the new website and revamped helmet lineup demonstrate that they have what it takes to compete in the big leagues. The new CMS GTRS Carbon DNA is the Portuguese company’s top-of-the-line helmet in the “Supersport” category and it’s a very worthy entry. This helmet is about as light as it gets for a full-face motorcycle helmet; in fact, it’s the lightest size XL full-face helmet we have ever reviewed, and that’s a lot of helmets: 350+ motorcycle helmets of all types. The GTRS Carbon DNA has a “multiaxial carbon fiber” shell and the GTRS design is also available in a multiaxial carbon fiber, Kevlar and aramid composite shell construction, called the GTRS 3. 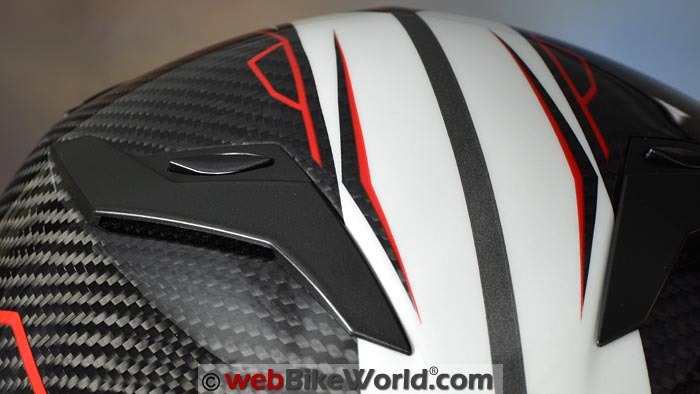 But for lightweight helmet aficionados, the Carbon DNA is the one to have. 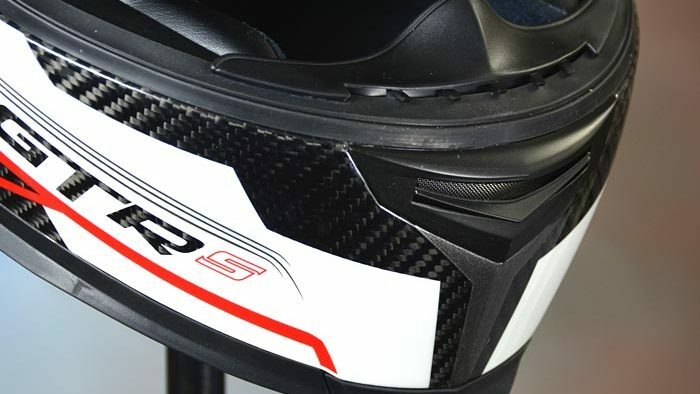 While some carbon fiber helmets leave out important details in an attempt to shave grams, the Carbon DNS will have none of that. It’s beautifully finished — both inside and out — and the red/white paint scheme perfectly complements the modern angular styling. The overall construction, quality and especially the paint and finish is outstanding on this example. The red and white paint scheme enhances the carbon fiber weave without hiding too much of it — a common problem on painted carbon fiber helmets. The new “Wind Lock Flex” face shield is noteworthy; it has a very easy-to-use single button release system, yet the face shield raises through strong detents to help keep it locked at speed. It even has a small first opening position for defogging. 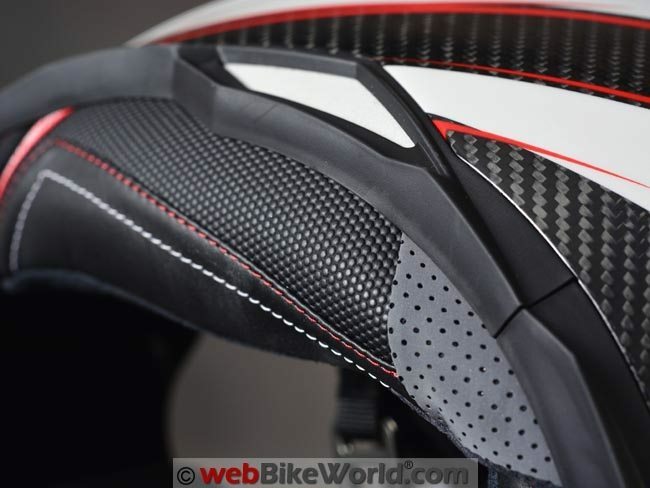 The interior is also sometimes overlooked in carbon fiber helmets as a way to trim grams, but the GTRS has a very comfortable interior with generous padding to cradle the cranium. The fabric is made from Coolmax by the Italian SITIP S.p.A. manufacturer. It has an anti-microbial treatment and it’s also removable, washable, anti-allergenic, anti-bacterial and anti-fungal treated. Bottom line, this is a beautiful helmet that has many high-end features, which make its ultra light weight even more remarkable. Score: The GTRS Carbon DNA gets an “Outstanding” rating from us for finish and overall quality. See the Summary Table at the bottom of the page for a description of our rating system. The hand-made carbon fiber shell is made in one size only, with 3 different EPS interior liners. Our helmet is a size XL and it is listed as fitting a 62-63 cm head. That seems slightly off; I’d say a 61-62 cm “Neutral” to “Slightly Narrow” head is more like it. I think it would take a fairly narrow 63 cm head to fit the size XL. The interior shape and fit is very similar to the current Nolan/Shoei paradigm. It’s a “Slightly Narrow” fit much like a modern Arai Signet-Q (review) “Long Oval” (which is not like the older style Arai Long Oval narrower shape). So anyone comfortable in a Shoei, Nolan or Long Oval Arai should feel right at home in the GTRS. But, don’t despair if you’re not — most “Neutral” head shapes should feel right at home and even the Editor found the GTRS comfortable, albeit with a tight eyeglass fit and a little more room up top than is optimal. The Coolmax liner fabric and the surprisingly (for this type of helmet) generous padding are very comfortable and even on some recent toasty and humid 32 C degree days, the helmet lining made the rides bearable and even comfortable. The ear pockets are lined with a thick section of fabric but as a “Supersport” helmet, the GTRS isn’t really designed for an intercom system and the stylistic treatment around the bottom of the shell makes it a challenge to mount a standard intercom bracket. Stick-on systems will be the thing to have on this one, with thin speakers. Score: The GTRS Carbon DNA gets an “Outstanding” rating for fit, comfort, liner materials and padding. Detailing around the lower part of the GTRS is exemplary. 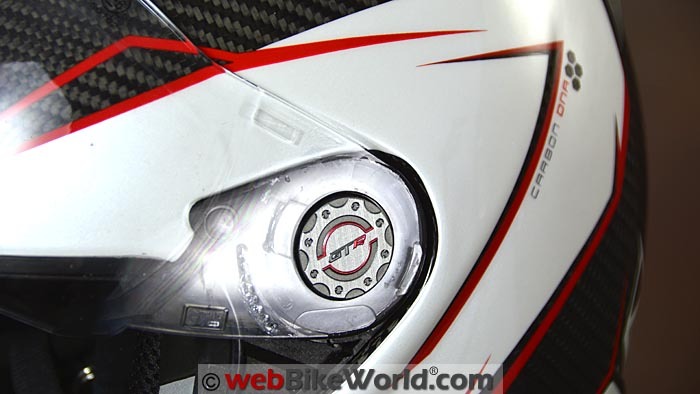 As a “Supersport” helmet, you might expect limited visibility from the GTRS’s eye port. But the shape of the eye port at each side has been made more upright or squared off, which actually gives excellent horizontal sight lines. This helps during over-the-shoulder head checks or at when stopped on the bike. The vertical area isn’t quite as generous but I’d say it’s slightly better than average. Also, due to the “Supersport” designation, there’s no internal sun visor in the GTRS — a good thing, because it would only add weight and decrease the crush zone at the forehead. The face shield rotating design is new for CMS. It has 6 very tight detents and a first opening position for city use or defogging. This first position is a touch larger than optimal but it works well. The face shield fits tight to the eye port gasket and the strong detents hold it firmly closed. There’s no additional locking mechanism but the face shield fits tightly enough that one shouldn’t be needed. CMS also added a second lift tab on the right side, which is a handy bonus. The new face shield removal system is very easy to use. Raise the face shield, push in the spring-loaded button and the shield can be released. To replace it, snap it back in over the button. Score: The GTRS gets an “Excellent” rating for the overall quality and operation of the face shield. Top vents are the low-profile type, which limit air intake. Chin vent has a mesh screen backing to prevent bug intake. Note “floating” rear spoiler and exhaust vents at the “corners”. The GTRS chin vent works very nicely to flow air with an even distribution over the rider’s face. The chin vent has a metal mesh grid to prevent bugs from entering and the shape of the chin vent intake along the top of the chin bar distributes the air better than most full-face designs. The helmet also comes with an installed chin curtain, which does a good job at keeping the air from flowing up from underneath. The top vents aren’t quite as functional, as they have a low profile that may improve aerodynamics but limits ultimate air intake. The system works with tiny rockers on top of each vent, which open a stopper just a few millimetres over the vent hole, so not much air flows in. The full liner along the top doesn’t help; it’s more of a street/touring liner than a race helmet liner, so the air that does come in is blocked by the liner from directly flowing on to the rider’s head. That being said, even in the recent 30+ degree C humid weather we’ve been having recently, I don’t notice much heat or sweating on top and the chin vent keeps my face comfortable…as long as I’m moving through the air. There are 4 rear exhaust vents on the GTRS: two up top and two along the bottom “corners” or angles molded into the helmet. Overall, the ventilation system works pretty good and I’d say better than the average full face, although not up to something like Arai Corsair V (review) standards. Score: The CMS GTRS Carbon DNA ventilation system rates an “Excellent” overall. One of the surprising features of the GTRS Carbon DNA is noise control. Most of the time, a racing or Supersport helmet — or a carbon fiber helmet — isn’t necessarily the quietest, but the GTRS does a good job at controlling noise. The relatively thick padding and liner design helps a lot and wind turbulence noise around the bottom is low, even behind a windscreen. The ambient noise from the engine and wind is also well dampened, so overall I’d rate the GTRS Carbon DNA as slightly better than average when it comes to controlling noise levels. Some wind noise can be heard from the top vents, depending on the speed and angle of the head, but overall credit goes to the liner and padding. We were out on a ride comparing the new Nexx XT1 helmet, which is also generally in the “Supersport” category and the differences in noise control were dramatic as we swapped helmets back and forth. The Nexx was much louder, with engine noise also leaking through where the liner splits at the lower rear, between the cheek pads and the rear. The overall shape of the GTRS helps with aerodynamics and the “floating” spoiler and design keep the helmet stable when riding. Score: The GTRS Carbon DNA rates an “Excellent” rating for noise control. 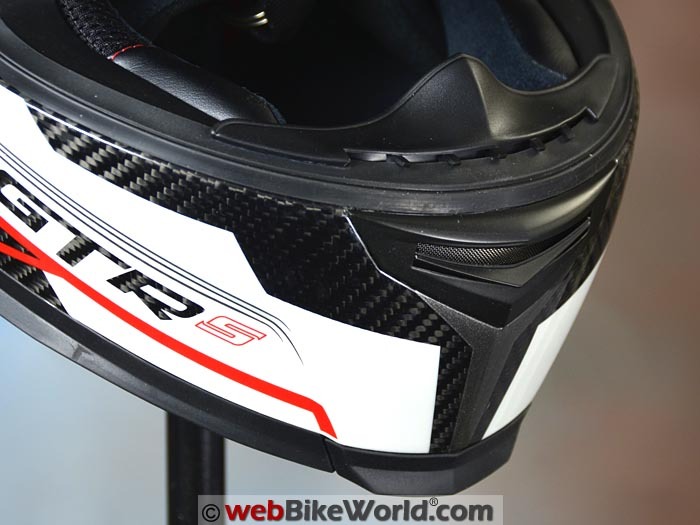 View the CMS GTRS Helmet Video on the webBikeWorld Vimeo Pro channel. This GTRS Carbon DNA in size XL weighs a super-light 1321 grams (2 lbs. 14-3/4 oz.). That makes it the lightest size XL helmet we have ever reviewed. 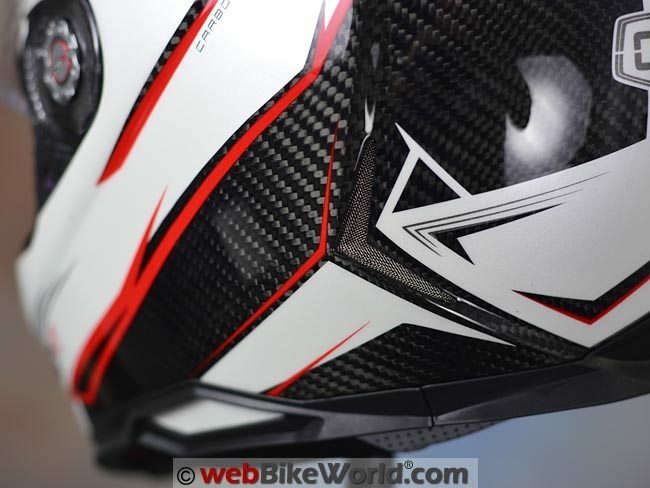 It’s also the second lightest full-face helmet we have reviewed, beaten only by the original CE version of the Nexx XR1R Carbon (review) in size large, which we weighed at 1219 grams. 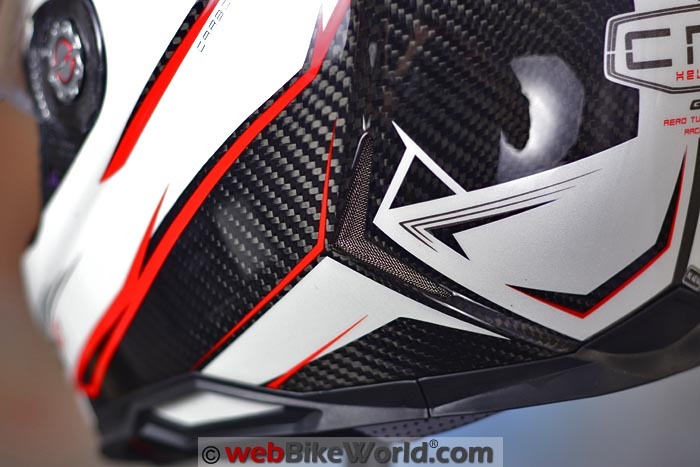 The next closest full-face helmet is the Nexx XR2 (review) in size XL, which weighed 1365 grams. So that is a fantastic result — especially so when considering that the GTRS Carbon DNA feels very comfortable as a street helmet and it has all of the street helmet “bells and whistles”. Score: The GTRS Carbon DNA gets an “Outstanding” rating for its low weight. The GTRS uses double D-rings and a gram or two was saved by using hook-and-loop as the chin strap retainer, rather than a metal snap. The chin strap padding is nice and thick and comfortable, so no issues there. 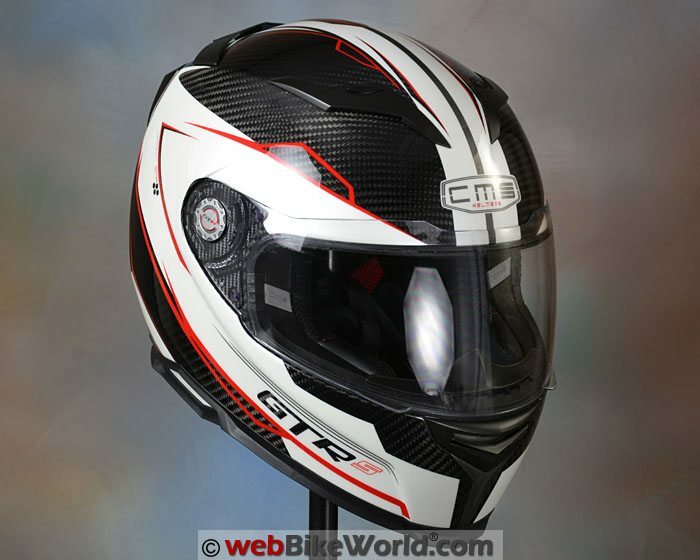 The CMS GTRS Carbon DNA is one of the nicest full-face carbon fiber helmets you’ll find. The overall styling and the graphics treatment on this red and white version is stunning. You won’t have to give up much — if anything — for that ultimate light weight, because the GTRS is also very comfortable for general street use, despite the “Supersport” moniker. And the price is very competitive for this type of helmet. The only issue is finding a CMS helmet retailer, as the company just isn’t as well known or distributed as the typical mass-market brands. But finding one is half the fun. And one thing’s for sure: you’ll have a unique helmet that will be the envy of your local club. From “E.W” (August 2015): “I received my CMS GTRs Carbon helmet a day after I left for a two week bike trip so I don�t have an extended report on it. I did find a store in Portugal and although there were some minor language barriers all in al the customer service was good. 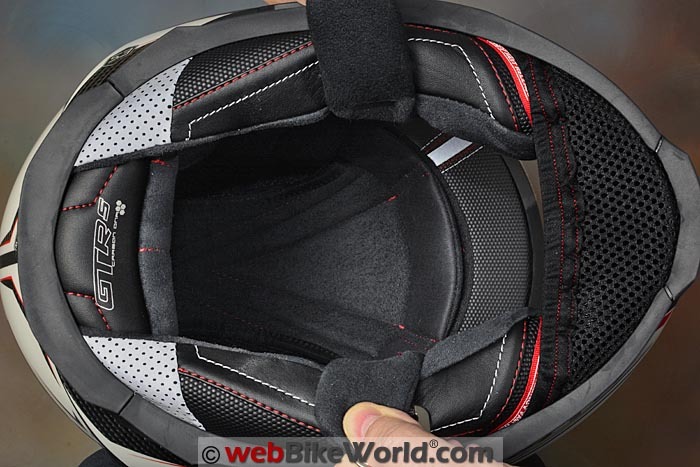 I�ve always felt webBikeWorld reviews were dead-on accurate and the review on the GTRs helmet is no exception. It is beautifully made and incredibly light. The finish and the liner appear to be as high end as any premium helmet. I agree with the review but point out a few things that only become apparent after some extended use. The top vents are so small that I can�t tell if they are open or closed. I did two 200 mile days back to back in the Florida summer heat (90+F) and if you are at anything under highway speeds you are going to want to keep the visor cracked. I could not get the visors on and off as easily as it was done in the video. It may take some practice but there is a lot of pushing, pulling and cursing involved in the process. Next, either the detents in the visor mechanism are too stiff or there is too much flexibility in the visor itself. If you pull it shut with the tab on either side the opposite side will not close properly. You need to pull that side down as well. So if you are accelerating up to speed and use you left hand to pull down the left side of the visor you have to reach across your face with your left hand to close the other side or take your right hand off of the throttle to close the right side. I think that the detents might relax after a little break in but it�s a flaw in an otherwise great helmet. The padding on the chin strap extends so far across the strap that it�s difficult to tighten the strap properly. I think this is something I will develop a technique for down the road. The other negative that I encountered was when I did a high speed over the shoulder check when changing lanes. Compared to other helmets I have owned I thought the GTRs caught a lot of air. My helmet does not have a DOT approval on it. I hope CMS gets it approved. Despite some minor issues I am happy with the helmet. It�s comfortable, light and very quiet. I don�t regret the decision to buy one.